Australian schools are urged to download a free poster and resource book to explore this year’s National Science Week theme: Game Changers and Change Makers. Who are the past and present scientists, engineers, technologists, mathematicians, designers and innovators that improve our lives? Schools can also apply for funding of up to $500 to explore this year’s theme. The 2018 free National Science Week online resource book will help you develop interesting activities for your students. 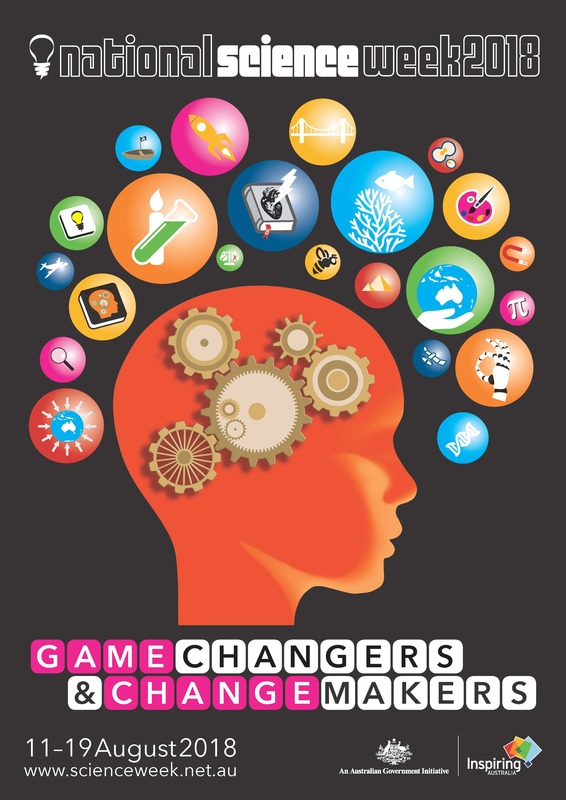 Developed by the Australian Science Teachers Association, the Game Changers and Change Makers resource book of ideas for National Science Week 2018 is an 84-page digital resource packed with past and emerging research and ideas from the worlds of science, science fiction, design, technology, engineering, mathematics, medicine, marine science and agriculture. It suggests dozens of activities and events you may consider presenting during National Science Week that this year runs from 11-19 August 2018. A Game Changers and Change Makers ePoster for schools can also be downloaded and printed. Small grants of up to $500 are available to all Australian schools—preschool through to senior secondary. Applications are now open and close on 23 April 2018. The 2018 National Science Week schools theme takes inspiration from three momentous past events. 2018 marks the 200th anniversary of the publication of Mary Shelley’s Frankenstein. It has been said that: ‘No work of literature has done more to shape the way people imagine science and its moral consequences. Frankenstein continues to influence the way we confront emerging technologies, conceptualise the process of scientific research, imagine the motivations and ethical struggles of scientists, and weigh the benefits of innovation with its unseen pitfalls’. http://frankenstein.asu.edu/With this in mind, some of the scientific discoveries, inquiries, activities and themes used in this resource book examine game changers and change makers in the fields of bio-medical engineering, bio-technologies, prosthetics, bionics, genetic modification, ethics, and brain enhancement. 2018 marks the 40th anniversary of the birth of the first test tube baby. Louise Brown, born in 1978, was the world’s first artificially conceived baby. This was a milestone in innovative science and genetic engineering.Today, most countries have established fertility units that incorporate biotechnology, genetic pre-diagnosis and nanotechnology techniques that once could have only been thought of as ‘science fiction’, providing society with a wide selection of fertility options available for society to utilise. Therefore, scientific discoveries, inquiries, activities and themes in this resource book also include a focus on biomedical science, genetics, ethics and biological science. 2018 celebrates the International Year of the Reef, through the International Coral Reef Initiative. The resource book includes scientific discoveries, inquiries, and activities about reefs, the animals and plants that live within them, as well as reef scientists and game changers, the understandings of whom help boost our collective knowledge and knowledge about these amazing marine environments. For more information about how schools can get involved in National Science Week visit the campaign website.